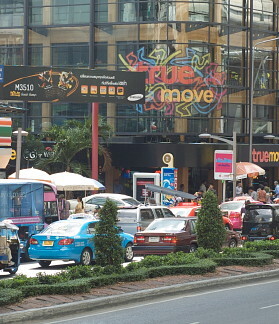 I was in the center of Bangkok a couple of days ago collecting an iPhone 3Gs for review that the carrier here, True Move, was letting me play with for about a week. As I was chatting to the executive who gave me the device, who is also a Mac owner, I made room in my backpack and he saw my Nikon SLR. "Do you always carry a camera?" he asked. I do and it gets to be a bit of an effort, particularly if I have the MacBook Pro with me as well, but I am a bit of a gadget freak. While I love my iPod touch, with all its extras, the iPhone 3G that I have on loan from Apple here has revolutionised my ability to carry out work on the go -- I leave the computer at home most of the time now -- with the apps, the phone (of course) and the camera. 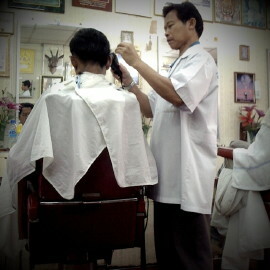 I have reviewed several of the Apps in the Bangkok Diary over the last year or so. I was a bit surprised by the way the camera is able to take such good shots despite its limited capacity and I examined this in an article I wrote for the Bangkok Post in August, Some interesting Apps for the iPhone Camera. One of those apps was Camerabag which adds a selection of filters that allow a user to adjust images, either in the photo library or direct from the camera. Those from the camera are larger than the library ones as the latter have been optimised -- Apple's word for made smaller -- for the iPhone. The filters can be applied several times to images if they have been saved into the library (Camera Roll) and this also works on the iPod touch for either images in the library or for screen shots. The touch does not, as yet, have a camera. Despite the success of such images which have won competitions and quite a following on Twitter, there are a couple of shortcomings This is despite the enthusiasm of professionaIs like Chase Jarvis ("The best camera is the one that's with you") who shoots some 1,000 iPhone images a day and has now collaborated with Ubermind to come up with a Best Camera app [iTunes link] for the iPhone. I just weakened and bought this one as well: the iPhone camera is, well, fun. However my concerns with the way I use SLR and the iPhone centre on size limitations and spare capacity. I use Aperture on a Mac and shoot in RAW. Even optimised, there is not enough space on the iPhone for everything, so most images are on the computer. A normal situation. I also like to produce poster size (20" x 30") images and those shots from the iPhone lack a bit here. 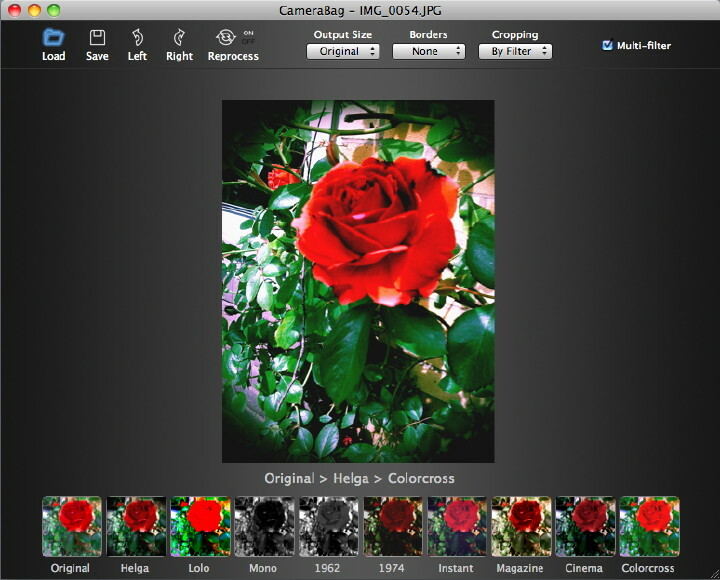 I was pleased to see yesterday (23 Sep 2009) that, following the success of the iPhone version Never Center have released a CameraBag application for the Mac. Like the iPhone app (and they are thinking about one for the Blackberry), this allows a user to apply a filter, or a series of filters to an image and produce pictures with an older feel to them: dare I use the word, organic? Its prime feature for me after playing with it for about 36 hours, is its simplicity: click, drag, apply filter, save, done. What could be simpler? The application doesn't even have any preferences, so we seem to be experiencing a revolution (in two senses): instead of porting an app from a computer environment to the iPhone, this is developing for the iPhone, then porting to the computer. My experience with many of the best apps for the iPhone is that they do one thing and do that well. A bravo for those who succeed with this philosophy on computers. 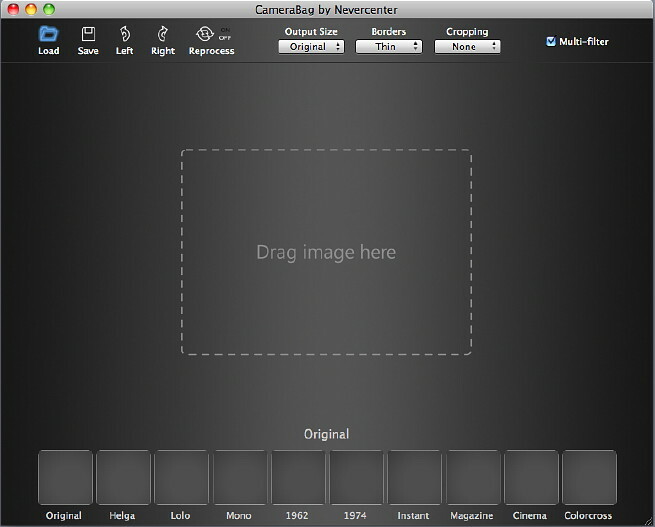 The CameraBag interface is a single black panel (not unlike the new QuickTime) with filters at the bottom. A series of actions is available at top left (Load, Save, Left, Right, Reprocess) and then three selectors for Output Size, Borders and Cropping. The size may be from 100 to 1600, or original, although that may not translate into as big as one wants as I guess that some transformation is taking place on import. Borders may be by the filter that is applied, or a user may choose from a selection; or none. Similarly cropping is by filter, from a selection; or none. At the far right is a check box marked "Multi-filter." With this, one can apply several filters on top of each other to create combined effects. I was able to drag images into the working panel, in three ways: from the desktop, from iPhoto and from Aperture. The Load button also accesses the folders and an image may be imported in that way. I preferred exporting from Aperture in TIFF format then loading an image, but (as per above) this seems to be changed on import. The image fits itself into the panel and resizes according to the space on the dektop that the panel takes up. As it is sized up to the full desktop, so the image keeps pace. The small filter sample panels below remain the same. Each of these mini panels displays what the current image would look like if that filter was applied: a useful and instant preview. Applying a filter changes the main image and with the multi-filter box checked, text showing the effects applied are displayed in the panel. Applying and removing any effect is a single click on the filter. 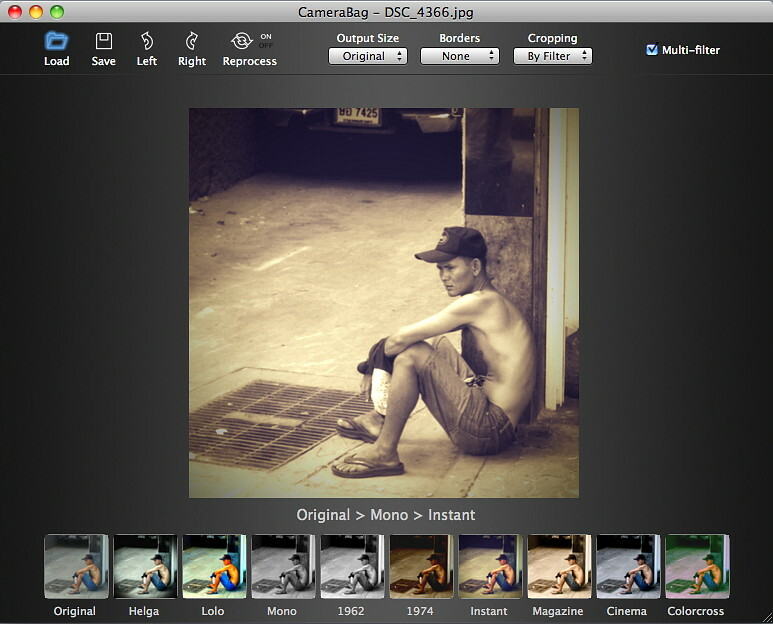 The Reprocess feature applies the effect(s) again and the text that popped up when the mouse was over this icon mentions, "the magic and serendipity of film processing" which in Bangkok, if you did not use the right shop, could mean the difference between levels of disaster. Saving images is as simple as the rest of the program, once the size, and any other features have been fixed. Currently the CameraBag exports images only in JOG format and the maximum I managed was a 1600 images of 1.1MB. This was however good enough to produce a 20 x 30 poster (using Posterino), although like racing engines, there is no substitute for size. This is an effective example of photo-manipulation software that is relatively cheap at $19. To install, I downloaded the file, paid online for the licence and only had to wait a few moments before the licence was available. Requirements are Mac OSX 10.4 or above. PowerPC or Intel CPU, 512 MB RAM and 10 MB Free Hard Disk Space. I installed it on a 2.16Ghz MacBookPro 15" with 2G RAM. Although, currently this is a Mac only program, Never Center are asking for input from Windows users to see if there is enough interest from that quarter.